Nuclear energy is newer than most other forms of energy that we use. Not until the early 1930s did scientists discover that the atom is made up of proton and neutron particles. Years later, in 1938, two German scientists, Otto Hahn and Fritz Strassman, along with Austrian physicist Lise Meitner, discovered that they could split the nucleus of a uranium atom by bombarding it with neutrons using a process called fission. As the uranium nucleus split, some of its mass was converted to heat energy. In 1942, Enrico Fermi, of Italy, and a group of other physicists noticed the fission of one uranium atom gave off more neutrons. This, in turn, could split other uranium atoms, starting a chain reaction. They soon realized that enormous amounts of energy could be produced by this process of nuclear fission. Otto Hahn won the Nobel Prize for his discovery of nuclear fission and Enrico Fermi received a Nobel Prize for creating the world's first nuclear chain reaction. 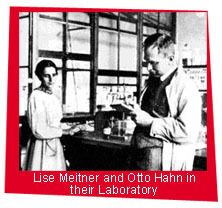 In 1966, Lise Meitner was awarded the United States Enrico Fermi Presidential Award. This honor was established in 1956 as a memorial to Enrico Fermi who succumbed to cancer at the age of 53. Nuclear fission was first used in the 1940s during World War II, which prompted more research into atomic energy. Not until 1953 was the first usable electricity from nuclear fission produced at the National Reactor Station, now called the Idaho National Engineering Laboratory. In 1954, the world’s first nuclear power staion to generate electricity for a power grid, was at the Soveit city of Obninsk. Then in 1955, Arco, Idaho, became the first U.S. town to be powered by nuclear energy. Today nuclear energy accounts for only 20 percent of the electricity generated in the United States. In 1958, the first commercial nuclear power plant was opened by President Dwight D. Eisenhower known as the Shippingport Atomic Power Station, located on the Ohio River in Beaver County, Pennsylvania. Today nuclear energy accounts for only 20 percent of the electricity generated in the United States.